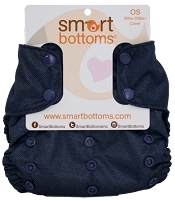 The Smart Bottoms Too Smart Inserts feature 4 layers of buttery soft organic interlock cotton. To use: Simply lay in your insert in a Smart Bottoms Too Smart Cover, tuck the insert under the flaps and snap the cover on baby! 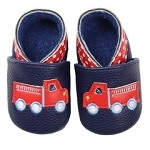 These can be used in any cover or pocket diaper however. 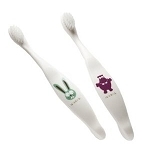 Care Instructions: Prep inserts before first use by washing 6-8 times. Test absorbency by pouring water on dry insert, should absorb instantly. If it does not, wash a couple more times and try again. Number of washes required to properly prep depend on type of washer, detergent and hardness of water. Wash and Dry Warm, No Bleach, No Fabric Softener. Once prepped, these inserts absorb as much and last as long as my Smart Bottoms 3.1 AIOs. It's amazing that a smallish piece of cloth can hold as much as it does. 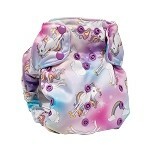 I use them in the Too Smart covers, but also as great doublers for naps in the 3.1s, and stuffed in my pocket diapers. These inserts are so trim. I have a heavy wetter, and they have leaked a couple times when I've been trying them out alone, but not every time (and they may not be fully prepped yet!). They are a great quality insert for a great price!